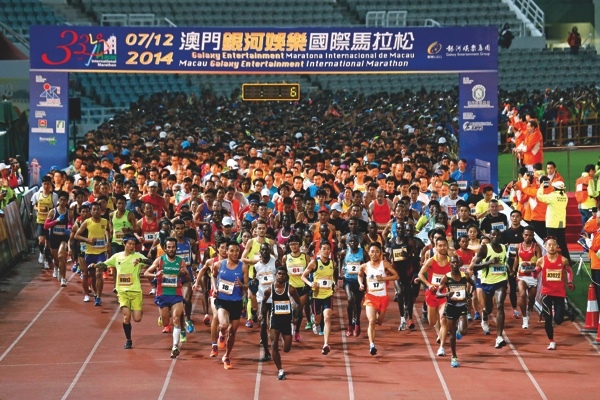 The Sports Bureau (ID) told the Times yesterday that the Organizing Committee of the Macau International Marathon decided not to disqualify Flomena Chepchirchir, the winner of the 2014 race. At the time of the event, Chepchirchir was banned from racing by the International Association of Athletics Federations (IAAF). old athlete from Kenya, won in Macau during an IAAF-decreed ban period, after testing positive for a controlled substance at the Birell Prague Grand Prix Marathon, Czech Republic, September 6, 2014. The ID revelaed last month that it had “discovered in January 2015 via news” that the athlete may have run in Macau while serving a ban. In response, the ID claims to have corresponded with IAAF, seeking confirmation and further information. The bureau also said that it attempted to contact Chepchirchir’s agent, who suggested that the runner intended to appeal the IAAF’s ban. “Pending the outcome of the case, retrospective action could be taken to disqualify” the Kenyan athlete and “adjust the results of the marathon accordingly,” the ID said last month. Meanwhile, the Times contacted the IAAF, headquartered in Monaco, to discover if any clarification had been provided to the local organizers. Yesterday, the IAAF confirmed that it had sent an e-mail on May 3 to the president of the General Association of Athletics of Macau (a co-organizer of the Macau Marathon, together with the ID) advising the organizers not to disqualify the athlete. The IAAF says that the decision was taken following legal consultation and after careful review of the Court of Arbitration for Sport’s (CAS) ruling. However, it appears that the notice of such disqualification never reached Macau, since the athlete was not officially disqualified. Apparently, the ID only considered taking action after the release of the Times report. According to IAAF, the CAS ruling is dated July 3, 2015 and reduced Chepchirchir’s sanction to a period of ineligibility of four months, beginning December 19, 2014. The Macau Marathon was held December 7, 2014, when Chepchirchir ran the 42.195 kilometers in 2:33:24, beating Kenyan team-mate Hellen Wanjiku Mugo. Yesterday, in response to questioning by the Times, the ID noted that the athlete’s period of ineligibility did not coincide with the Macau Marathon, following the amendment to the initial sanction ruled by CAS. “Therefore, the Organizing Committee has decided to follow the advice of IAAF and maintain the results and rankings as they stand,” the ID added. However, the bureau did not explain why the situation was only clarified after almost one-and-a-half years. The ID’s reply to the Times last month mentions that the local marathon organizers had been “in touch with the representing agent of Ms. Chepchirchir to seek clarification of the situation, and […] were advised that they were intending to appeal to IAAF against the ban.” This implies that until last month the ID was not aware of a CAS ruling dated July 2015.